So many hugs. So many high fives. So many smiling faces and selfies being taken. Joyride has once again come and gone and, as usual, it was a blast! 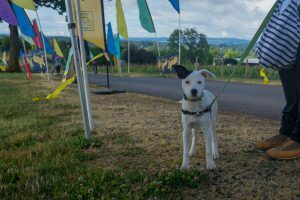 To kick off the 2018 Cycle Oregon event season, 800 female riders made the pilgrimage to Stoller Family Estates’ gorgeous grounds for a day of stunning backroad biking, close friends, local food and great music. Not even the on-again-off-again rain and an ornery, albeit brief, burst of hail could dampen the spirits of those on the course. These cyclists were out here to have a good time and they weren’t going to let a little weather stop them from doing it. And fortunately, it never did. 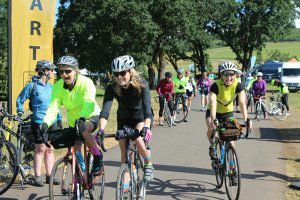 Riders of all ages and all abilities took to roads to soak up the amazing Willamette Valley scenery while getting their blood, and their pedals, pumping. Of the three routes, the medium and long ones were brand new this year. This means those who rode the 40-mile or 65-mile routes last year got a whole new experience this year. 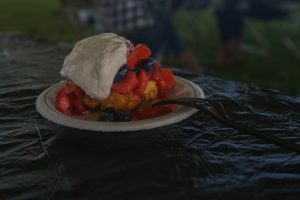 Just as soon as riders were ready to get off the bike and stretch their legs, they would arrive at loaded rest stops offering little pick-me-ups like wine tasting at Domino IV and fresh Sweet Oregon Berry Company strawberries. Once cyclists rounded that last corner and cruised up the flag-lined drive to Stoller Estates, it was time to party! Since it’s a good idea to refuel after a ride, a tasty IPA from Ninkasi or a Crater Lake Soda and all kinds of delicious local food were waiting under the tent. We’re talking Scratch Farm chicken, Zenner Sausages, Oregon mixed green salad, roasted and grilled seasonal vegetables from Sauvie Island. And back by popular demand was Lauretta Jean’s Biscuit Bar serving up fresh local berries and whipped cream on shortcake. Big Bad Beat was laying down a playlist full of soul hits that included a cover of Prince’s Purple Rain that was as pure as the waters of Lake Minnetonka. After their set, Ma Fondue took over the stage to keep the party going and get the people dancing. 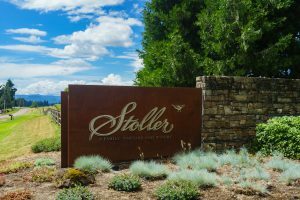 With another successful Joyride in the books we’d like to say thanks to Stoller Family Estates for the delicious wine and for being the best hosts imaginable, to Nossa Familia for the great coffee and to Bike Gallery for keeping the bikes biking and the riders riding. To Dominio IV Winery, Fisher Farms Nursery and the Draper Family, thank you kindly for the rest stop space. And most importantly, thanks to all the riders who make this event so much fun!